Sunday morning 12 boats lined up at Hancock`s Swing Bridge and we went through in two convoys of 6 to Salthouse Dock it took about 6 hours. The C&RT guys cheerfully did the locks and bridges for us in the rain. 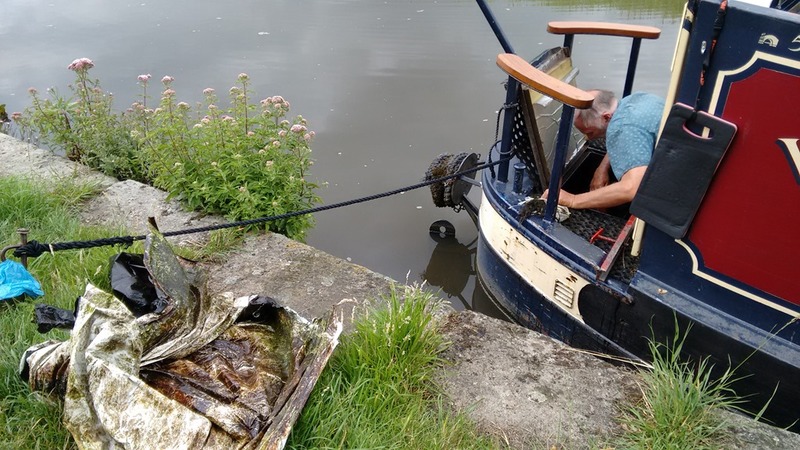 Before we reached Stanley Locks Chris had to stop 3 times and open weed hatch to clear the propeller of rubbish. Once through the four locks we were into the dock area proper changing from derilict warehouses to the modern waterside building and the iconic city landmarks. There were two more locks and three tunnels, one which took us under Liverpool Museum. When you went though the last tunnel and lock the view hit you massive great glass buildings, ships, museums etc. Unfortunately because of the rain many of the photos have rain spots, but will post some below and link to a Facebook album with more in. We moored up on our allocated pontoon and put our gas central heating on, we also took advantage of the free electricity and put the tumble dryer to dry our soaking clothes! Later we had friends visit, who used to go to our old church in Gloucestershire, we hadn’t seen them in years and we had a great evening sharing a meal and catching up with each other’s news. Yesterday we went to a huge shopping centre and in the afternoon the Liverpool Museum, we only did the first floor so back again today. Tomorrow is our wedding anniversary so we are on the lookout for somewhere to eat .Good train and bus service here so one day we are thinking of going on the open air bus, but we will wait hopefully for good weather, last night was very windy here 3 o’clock Chris had to go outside and rescue the satellite dish which had blown over. So we have been lazing in bed this morning. After our overnight stop it was time to get ourselves to tomorrow’s rendezvous point with the C&RT team who would ‘chaperone’ us into Liverpool tomorrow. It’s was only a 6 mile journey today but there were 5 swing bridges to operate on the way and each one of them had a different method of operation much to Joy’s dismay. They ranged from footbridges which you simply pushed round to fully automated ones with flashing lights and barriers to stop the traffic and hydraulic operation all by pressing a couple of buttons after unlocking them with a special ‘BW’ key. 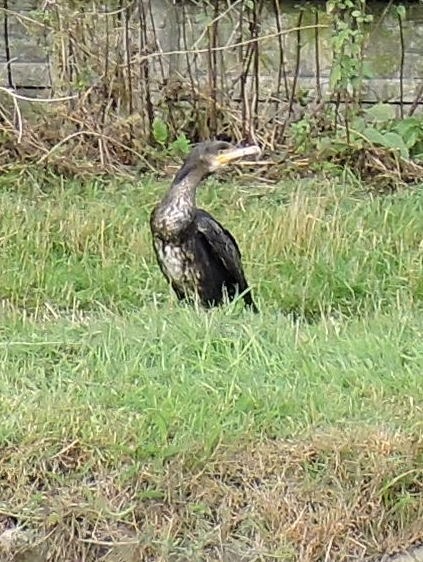 We saw this fellow on the way, is it a cormorant? On the way down we passed a couple of anglers who had just caught a huge carp (so they told us) and were taking photos, so we snapped them too. At Maghull we stopped for lunch and took the opportunity to visit the nearby Morrisons, it was then just an hours cruise down to our destination for today. 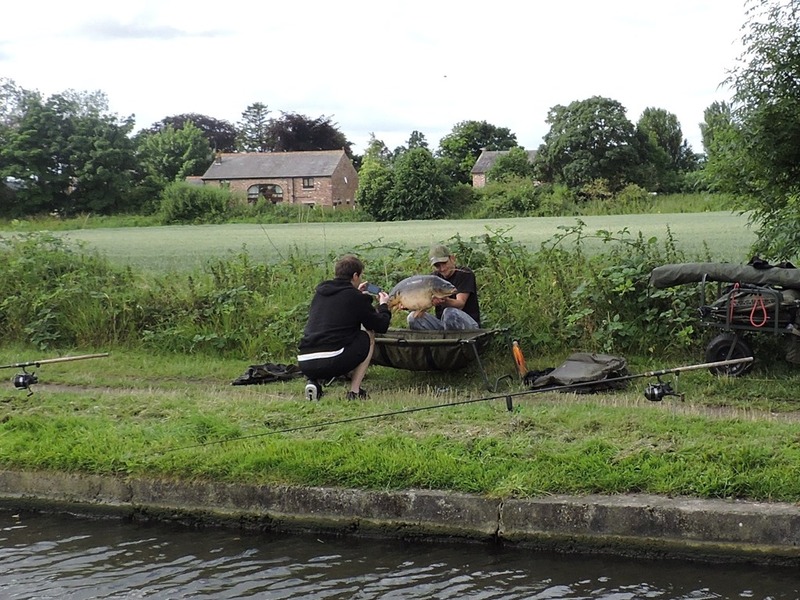 At Holmes Swing Bridge we caught up with two guys on another boat who waved us through and advised us to moor up there. Although there were a good number of walkers passing by, it was a peaceful enough spot right enough and we had an early night ready for an 8 am start tomorrow and declined our neighbours’ recommendation of the Bootle Arms which was just 5 minutes walk away. After a few busy days let’s try to catch up. With eight locks to tackle today (and they were wide locks which Joy wasn’t looking forward to) we made an early start in order to be at Poolstock Locks by 10:00 am as there was a problem with a badly leaking ground paddle and there had to be C&RT staff present to see us through. In fact the leak was so bad the lock filled it’s self without opening any paddles! Joy didn’t find it so bad as we teamed up with another crew. We stayed with them through Wigan and the apocryphal Wigan Pier all the way back to their mooring at Crooke (That’s Cr-OO-ke; NOT as us Southerners say it, like Australian for not very well) There were three more locks to do on our own the last one being 12 feet deep by which time Joy was quite confident doing them, as we left the lock, Ambush, an original 1930s Leeds & Liverpool Long Boat (70 footish) was coming in. 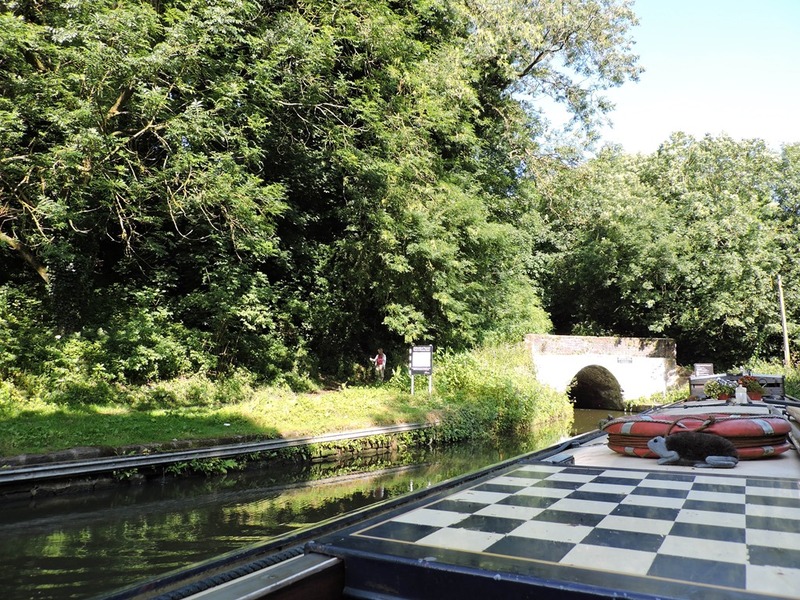 Just before this last lock we experienced a strange illusion of our map being wrong, there’s a railway & motorway bridge in quick succession; the difference in scale made it look as if the motorway bridge was nearer, but as we approached it was clear it was the other way round. 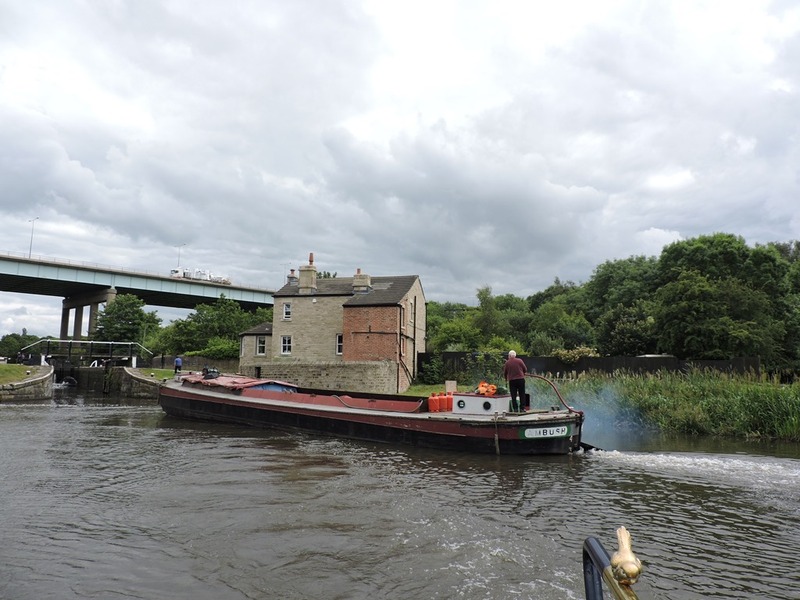 Just another half hour saw us at Parbold where we moored next to Dee, a Leeds & Liverpool Short Boat (60 footish) and short enough for the Wigan Branch locks. After our day’s exertion we treated ourselves to an Indian takeaway from The Parbold Tandoori and very nice it was too. Today was only supposed to take 3½ hours but we needed to get a pump out at Scarisbrick Marina, but before that there were 5 swing bridges to get through, they were mostly electrically operated but it’s time consuming as you have to moor up, stop the traffic, open bridge, go through bridge, moor up, shut bridge and off to the next one. 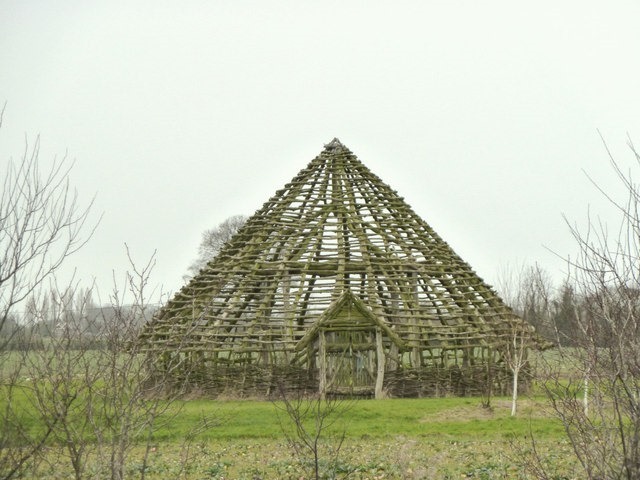 We saw this at Dutton’s Farm, Lathom and had to do a little research this evening to find out that excavations to install a gas pipeline in 1998 had revealed remains of an Iron Age and Romano-British farmstead on the site and this is a reconstruction of a roundhouse. For a detailed write up see here. At Halsall we managed to get a huge piece of plastic sheet around our prop too which delayed us again, then it started to rain! 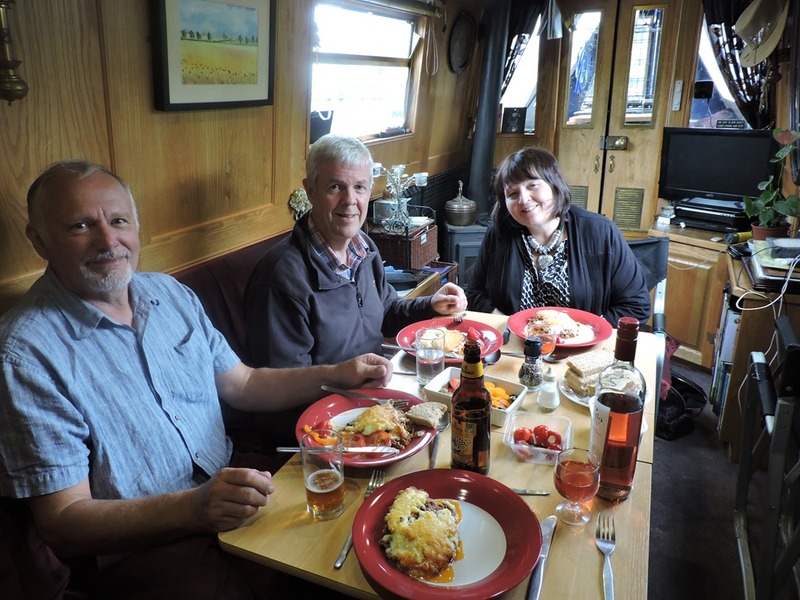 So a brief lunch stop at The Saracen’s Head for a beer and some take-away chips to go with the flan we had ready, then on through the drizzle to Downholland where there was a space for us outside The New Scarisbrick Arms, but it was dinner on board the boat for us. 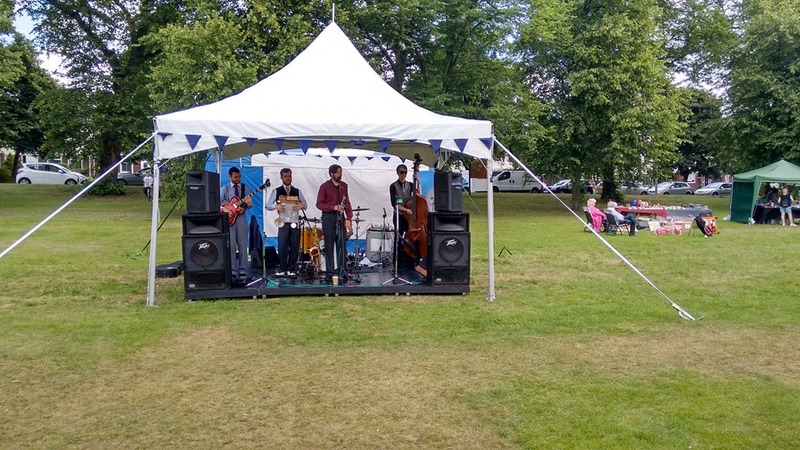 As our schedule dictates we don’t need to be in the Aintree area until 26th we stayed in Worsley for the weekend and on Saturday enjoyed their Summer Fair on The Green, the star turn for my money was The Afterhours Rauchestra who performed swing & jazz classics through the afternoon. There was a wedding reception at Worsley Court House (left) and the inevitable photoshoot was taking place on the towpath and on the steps where passengers used to catch the horse-drawn ‘Fly Boats’, the express transport of the day. 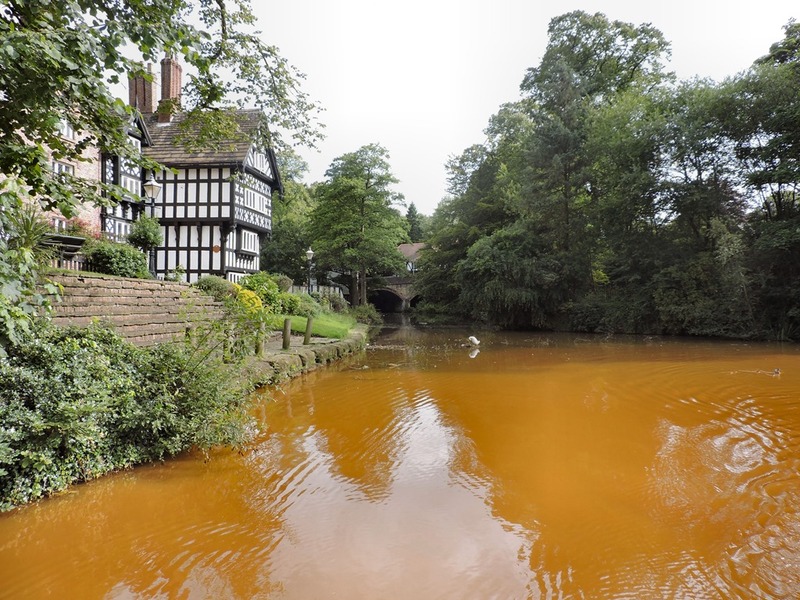 Notice the orange tinted water which is caused by iron deposits leaching out of the mine workings (entrance arches centre picture) which were the reason for the canal being built. If you’re interested in learning more visit canalscape.net from which the extract below taken. This building, along with ”Top Locks” at Runcorn, “The Old Number One” at Preston Brook, The London Bridge Public House at Stockton Heath, The Old Number Three at Dunham Massey, The Watch House at Stretford and the terminus at Castlefield were all “stops” or way stations for a “Flyboat” service that carried passengers, perishable and urgent goods as well as cattle (rings were fitted inside the boat to secure cattle to) along the canal. The passengers boarded the boats via steps leading down to a boarding wharf. There are similar steps at The London Bridge Public House. The Packet House is a Grade Two Listed Building. 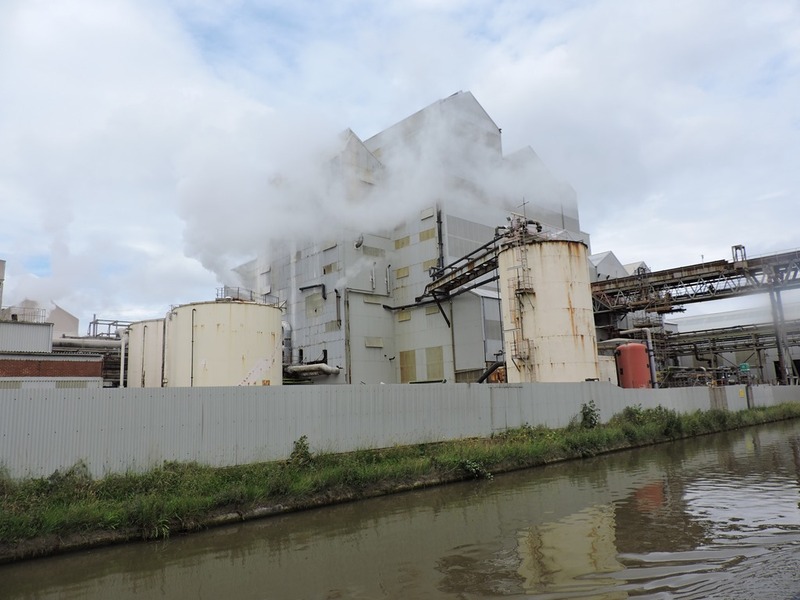 After a quiet day on Sunday we moved on to Leigh on Monday moving from areas dominated by the salt & coal industries to a cotton spinning area with the attendant mills along the canalside. As we passed under Leigh Bridge we were back on C&RT waters, the Leeds & Liverpool Canal. 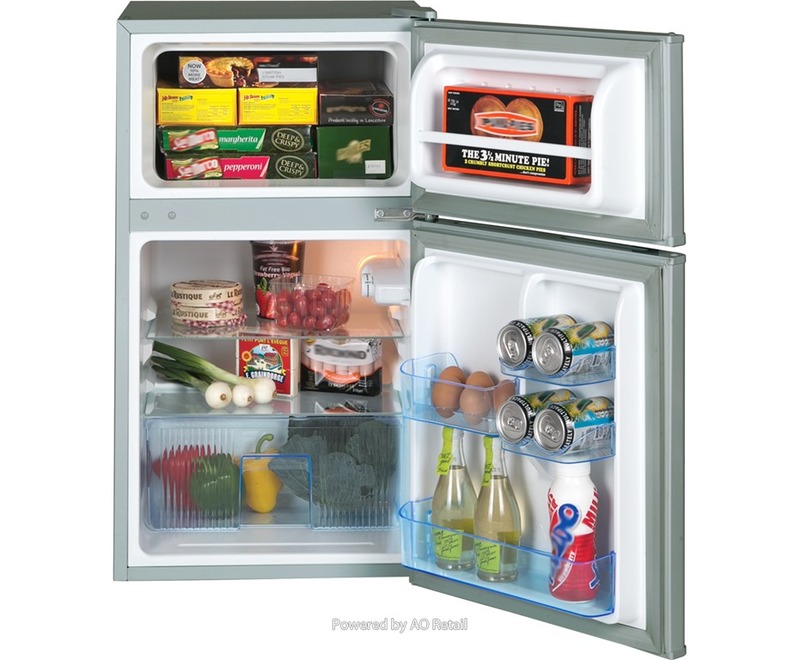 We only intended to stay overnight but our fridge decided give up on us and so on Tuesday morning we were able to move across the canal where the road access is easier and the day was spent trying to locate a replacement. We ordered on line from AO which was the only place who could promise next-day delivery! Megan, the lass who took our order was fascinated that we lived on a boat and she knew exactly where we are moored as she lives in Worsley. She also said we should try a Barm as it was a local speciality, so for lunch Joy ordered a Egg Barm in a cafe; it was a bit of an anti-climax as it turned out to be a fried egg in a bap. Apparently the bread rolls were originally made using the yeasty froth skimmed off as part of the beer brewing process. 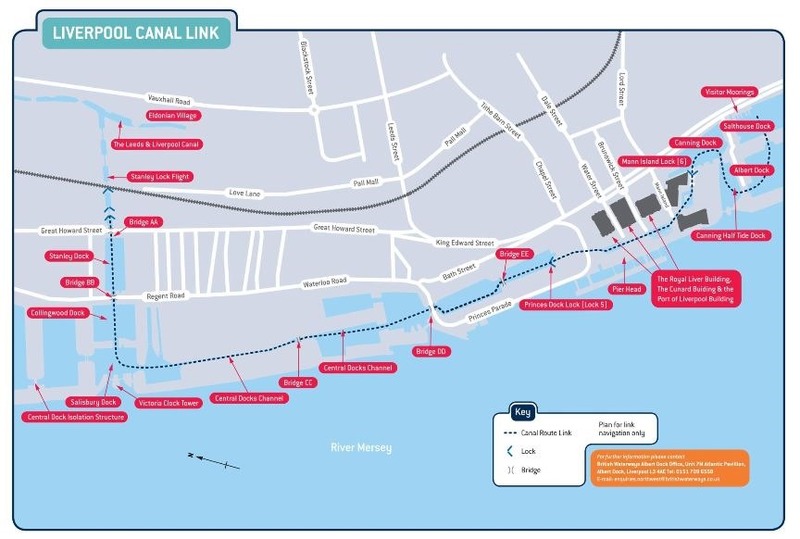 So here we sit so we are hoping for an early afternoon delivery and then we have to make up time, which could be tricky as there is problems with a lock on our route, let’s hope they sort it out today. Any thoughts of a lie in were shattered by a the sounds of a strimmer just over the fence, so we moved off as soon as we had had breakfast. The Bridgewater Canal is quite deep and broad so good progress can be made, what was remarkable was how few boats were on the move. 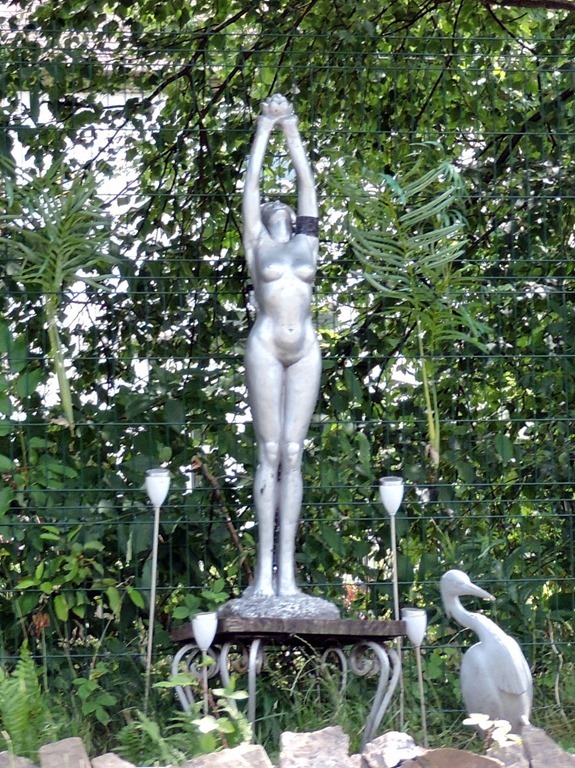 There are quite a few ‘cruising clubs’ along the way with lot’s of linear moorings, some even have their own club houses and even statues of silver ‘ladies’, but apart from these, facilities are few and far between. We found the first water point near Ye Olde No. 3 a canal side pub. 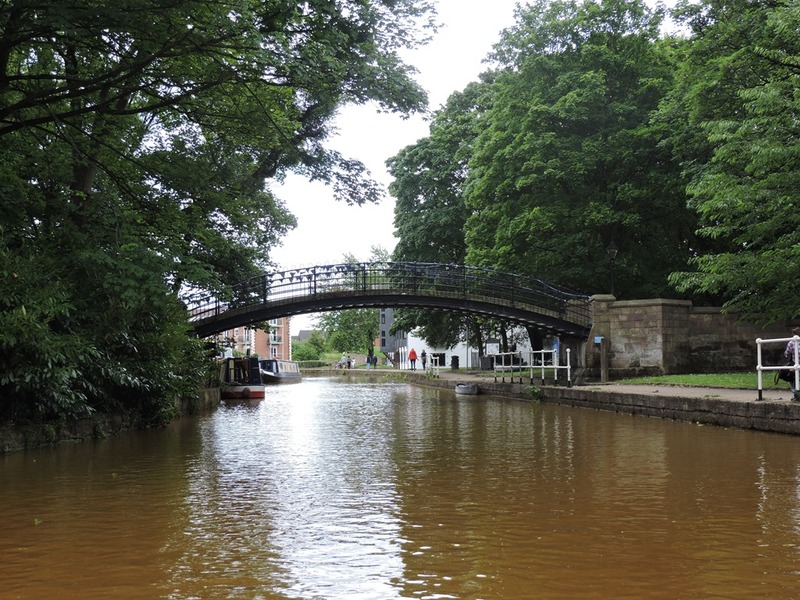 Lymm looks like a nice place and we will visit on our way back this way. 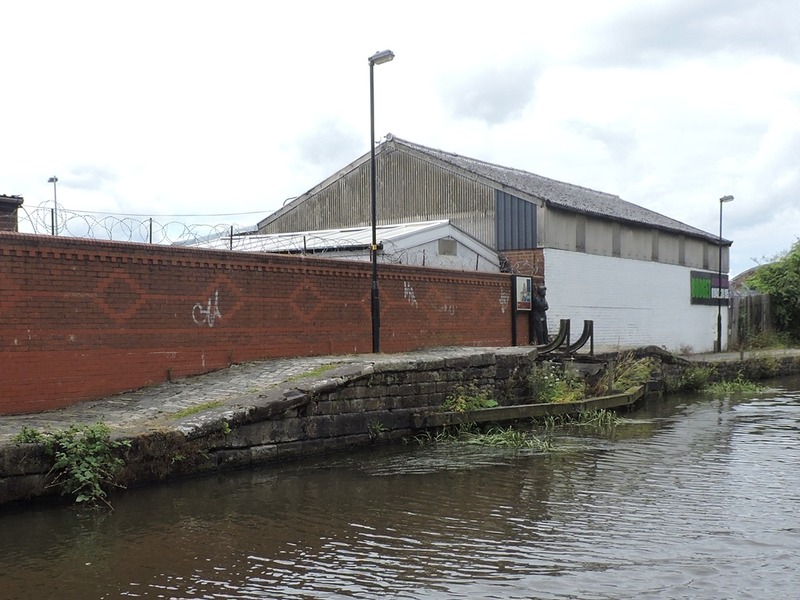 The canal runs straight as a die into Sale, past the sadly decaying Linotype Works and the contrasting new apartments (?) looking for all the world like a pair of cruise liners. We had thought we would stop for the night at Sale, but the main moorings at were full and although we found a spot next the The Bridge pub it was in a bit of a industrial area so we had a late lunch break and decided to do a few more miles, so it was on to Stretford Waters Meeting where we branched left onto The Leigh Branch. Just as we made the turn we noticed the smell of baking, was somebody cake making? No, it was the Kellogg’s factory just around the bend. 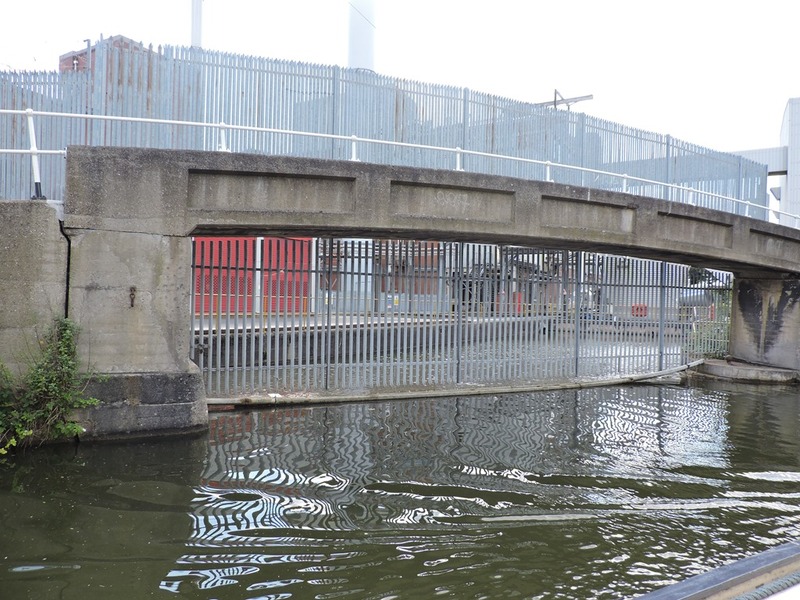 They still have canal access but it looks pretty permanently fenced off. Another mile or so and we were re-acquainting ourselves with The Manchester Ship Canal and crossing the marvel that is the Barton Swing Aqueduct, where the Bridgewater Canal can be swung through 90 degrees to allow the passage of large ships. 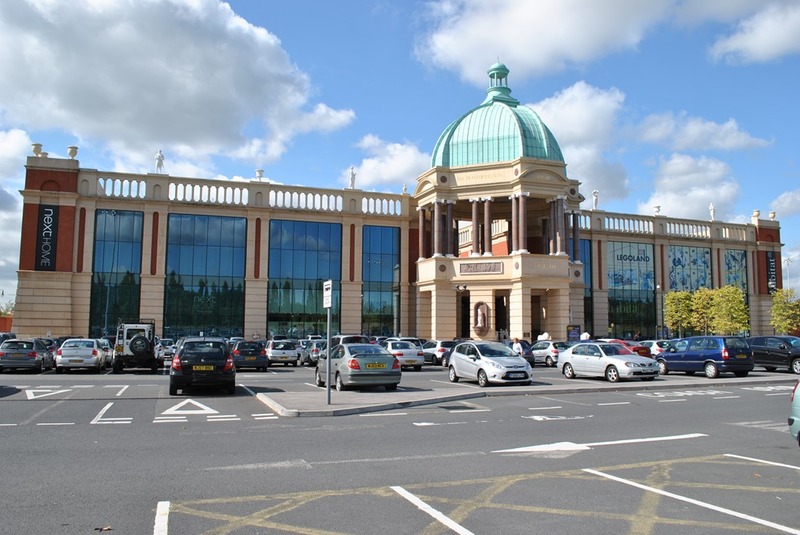 We toyed with the idea of mooring outside the intu Trafford Centre and glimpsed it’s impressive Barton Square entrance, but decided against it in favour of Worsley where we found the last spot on the visitor moorings waiting for us beyond the elegant footbridge. 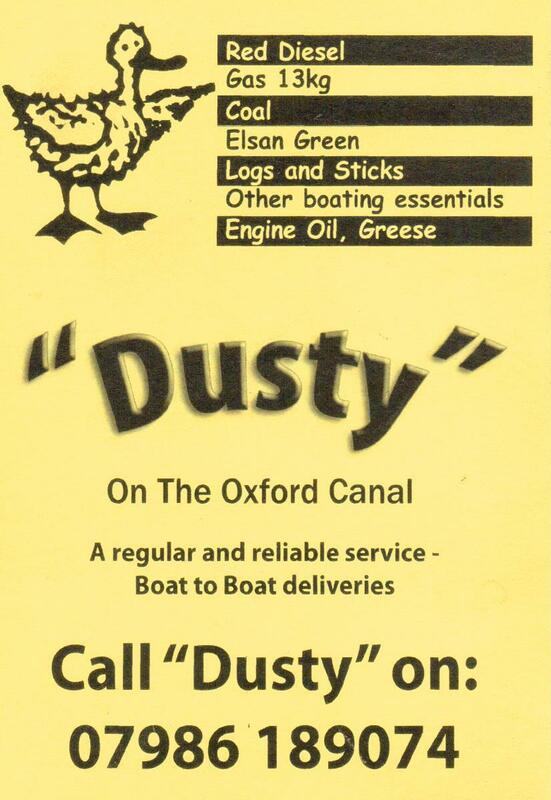 Just before the bridge are Worsley Dry Docks, I wonder what Tooleys Boatyard back in Banbury would say about this claim? 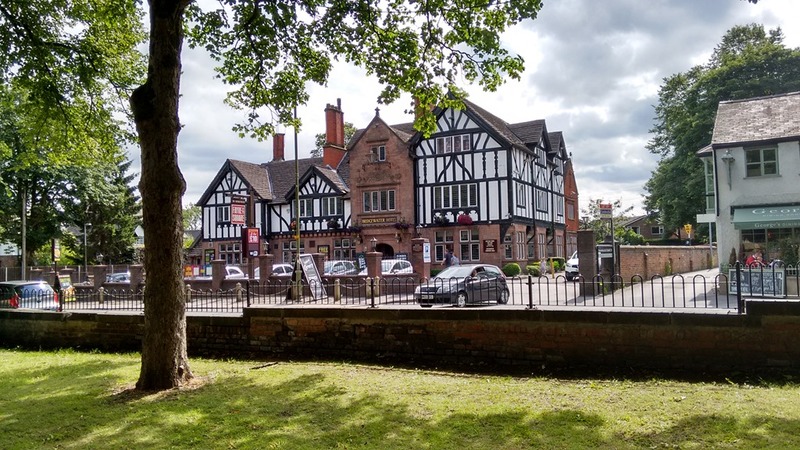 After a busy day travelling 20 miles in about 7½ hours we thought we would save ourselves the chore of cooking by patronising The Bridgewater Hotel, a grand looking mock Tudor building opposite our mooring run by the Fayre & Square group . We received a warm welcome and our drinks were brought to our table very quickly, but oh dear, it was ½ hour before our order was taken and another ½ hour before our meals arrived. Joy’s cod & chips had the signs of being left under a heat lamp to keep warm while my choice of Roast Vegetable Tart was unavailable & I had to settle for a cheeseburger instead. In mitigation it was a busy Friday night and they only seemed to have one waitress, but they were advertising that ‘Table Service had arrived’ personally I would have been quite happy to order at the bar to speed their service up! As we are a bit ahead of schedule we shall stay here for a couple of days and enjoy Worsley Summer Fête tomorrow which is taking place on the Green, just across the footbridge. Yesterday we had a day off, well from travelling at least. In the morning we did some housework, put the washing machine on then went and watched boats using the Anderton Boat Lift, we may try it ourselves later in this year’s trip. 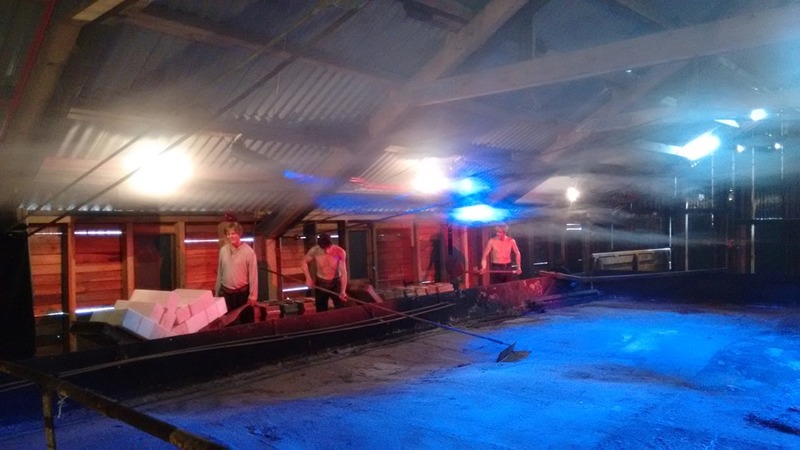 Soon after we moved across to the pub’s moorings as a creaky willow tree was overhanging our boat and after our friend Jane’s experience were taking no chances! We moored outside The Stanley Arms and had lunch there, while the washing dried in the sunshine. After our evening meal we went back up to the pub, just as a courtesy for using their mooring you understand, and was taken by this photo hanging with other canal related pictures in the public bar. 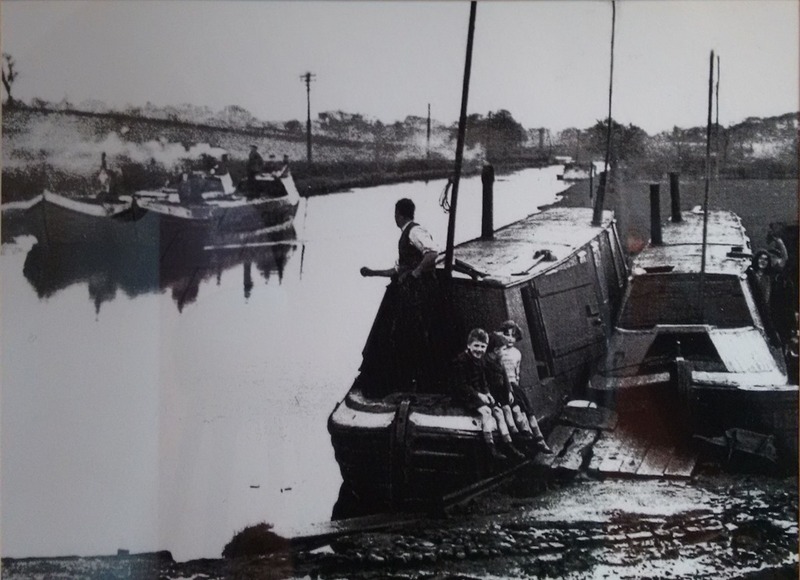 I would guess it’s from the 50s or 60s and as it is two converted working boats I wonder if the family had found themselves without a home other than their boats when carrying work on the canals dried up so they built a full length conversion over the holds. All supposition of course, but compare them with the centre boat sunk in the flashes I included in the last posting! This morning we were up and away by 8:30am (wow) as we had three tunnels to negotiate and another canal to get to. 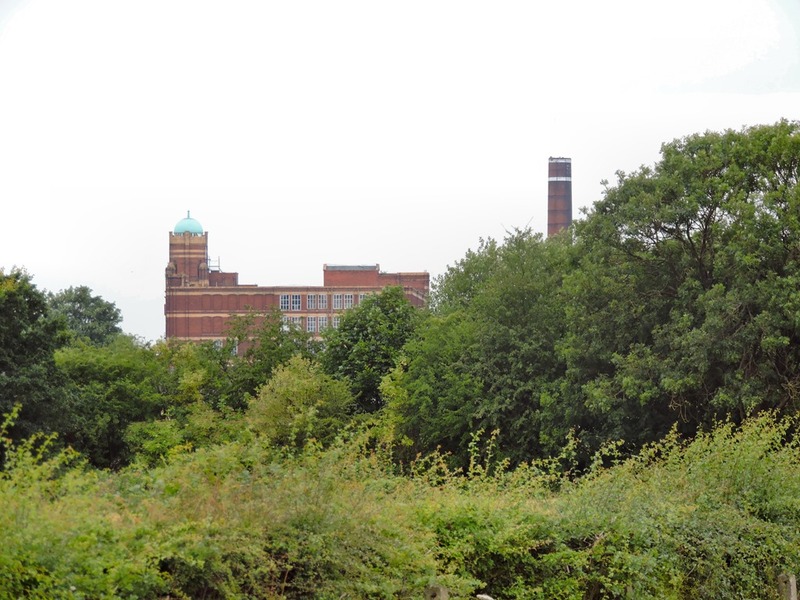 The industrial landscape around Northwich and beside the river Weaver was left behind this morning and we were glimpsing views across open countryside when the trees lining the canal permitted. 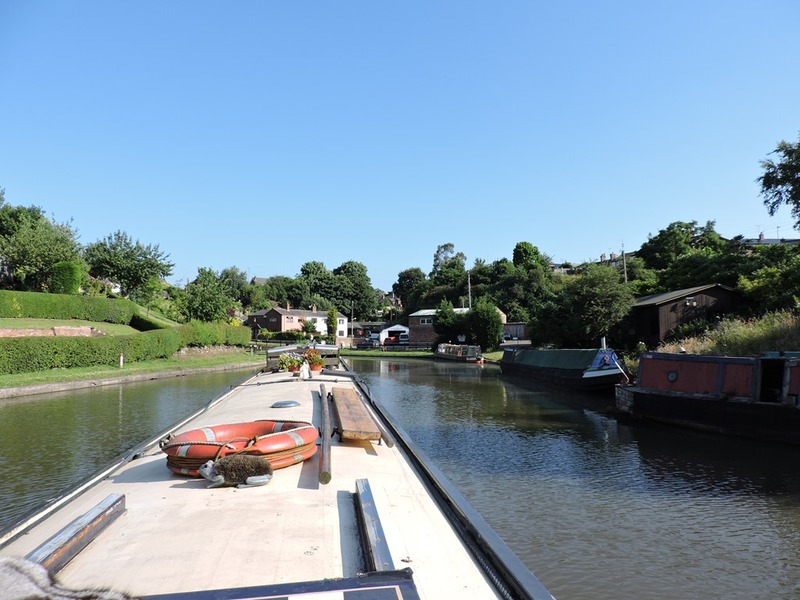 As we rounded a corner there was a large basin with moorings and afterwards a sharp turn into Barnton Tunnel. Once you are lined up there’s a line of sight through the tunnel so you just have to be sure there’s not a headlight headed towards you! 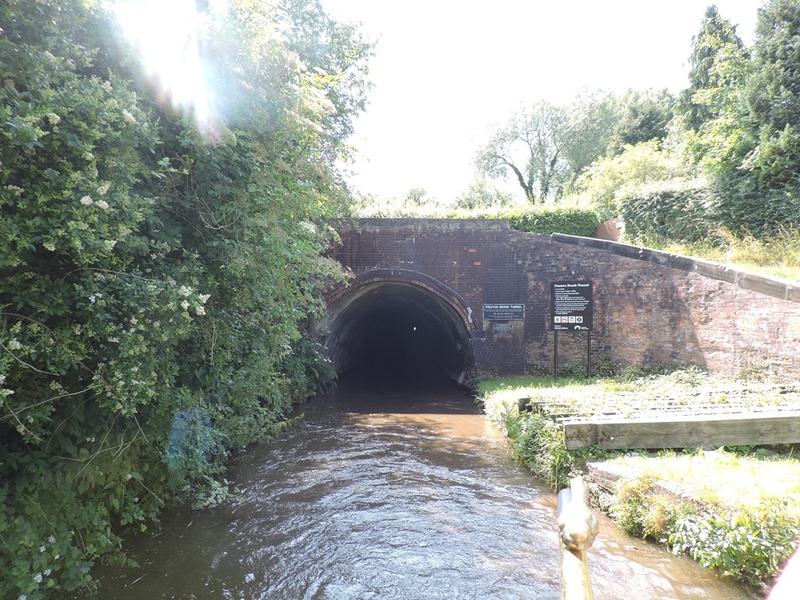 With less than a mile in between next came Saltersford Tunnel, now this one has a problem, it’s not straight but there’s a simple system, boats go north on the hour and for the next 20 minutes and south on the half hour and so on, giving 10 minutes leeway (minimum) to navigate the tunnel. As these tunnels are less than 500 yards long it works out well. 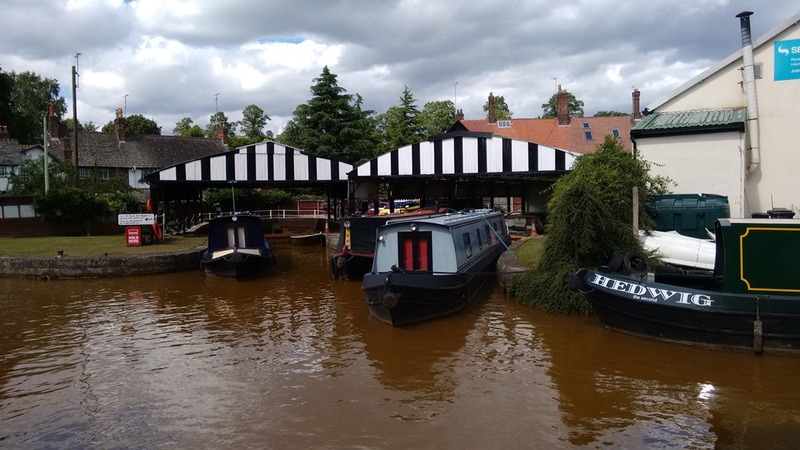 Just an hour and three-quarter cruise in the sunshine brought us to Dutton Stop Lock, which effectively separates the Trent and Mersey’s water from the Bridgewater Canal’s. In truth there was only a couple of inches difference but canal companies were very jealous of maintaining their water supplies. It’s also unusual because it’s wider than a narrow lock but not as wide as a normal widebeam lock. Look! You can see the light at the end of the Preston Brook Tunnel! It’s deceptive though as this one is three-quarters of a mile long so there is just a 10 minute window each hour to pass through it, but once again we turned up at the right time and only had a 5 minute wait to join the convoy of two other boats headed north before emerging into the sunshine and we were on the Bridgewater Canal. 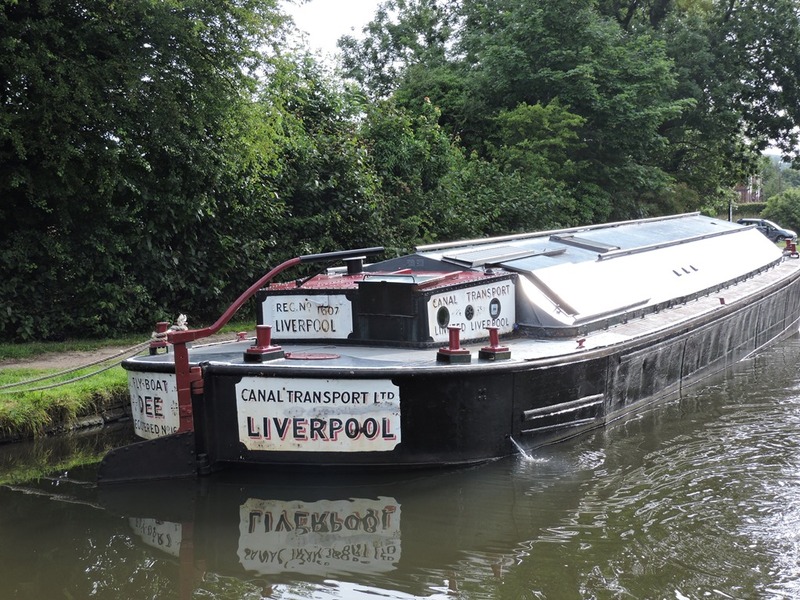 The Bridgewater Canal Company is NOT part of the C&RT network but there is reciprocal agreement for C&RT licence holders to use their waters for 7 days whilst travelling to another part of the network. There are more stunning views over the Cheshire countryside and I believe that is Runcorn Water Tower on the skyline. We called at Midland Chandlers to try to buy a large caribina clip and somehow managed to come out with a hand held air horn, a TV aerial lead and some polish, but no clip. We headed on, leaving visiting Runcorn for another time and moored up outside Moore Village Stores for a lunch break before ending our day’s cruising at Stockton Heath. 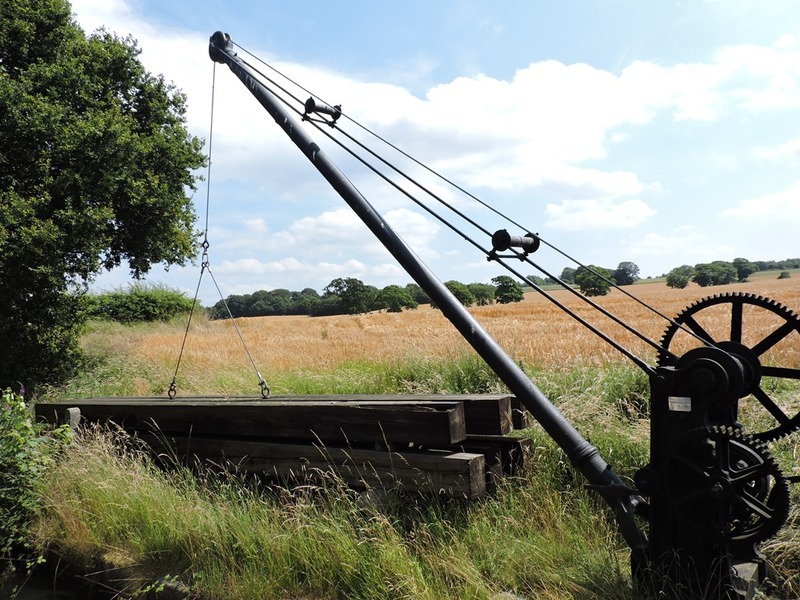 I noticed these canal-side cranes are in place to deploy stop-planks in case a section of the canal is de-watered for maintenance or in case of a breach. The planks are too long to be manhandled as on our familiar narrow canals. 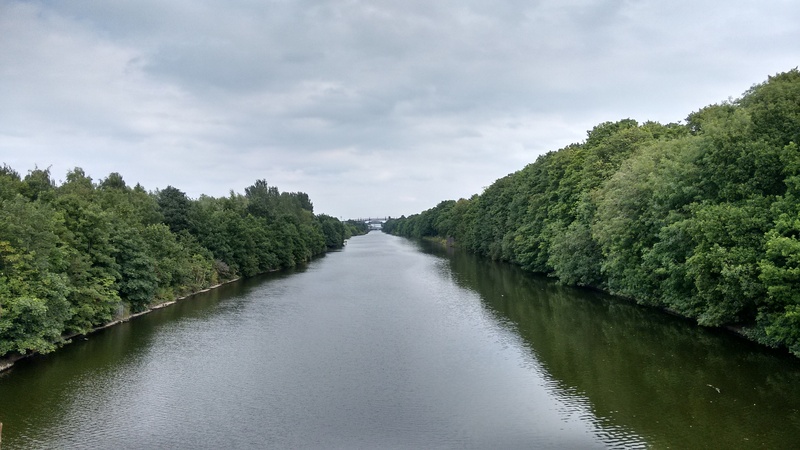 Manchester Ship Canal – Ooh! That looks too big for us! After a suitable break we caught a bus to the outskirts of Warrington to visit Morrisons and walk across one of the Manchester Ship Canal’s bridges. After our return journey we had a refreshing drink at the London Bridge Inn before returning to the boat for our tea. This morning we walked to the local Morrisons before tacking Middlewich Big Lock, big because it’s the first of the wide locks, but there are no more for quite a while. We shared it with a little narrowboat which the steerer assured me had a concrete hull and that it steered like a tub! As you probably know, Cheshire has, since Roman times, been involved in the manufacture of salt and the evidence is all around. There’s a good guide to the canal by the Trent & Mersey Canal Society here. 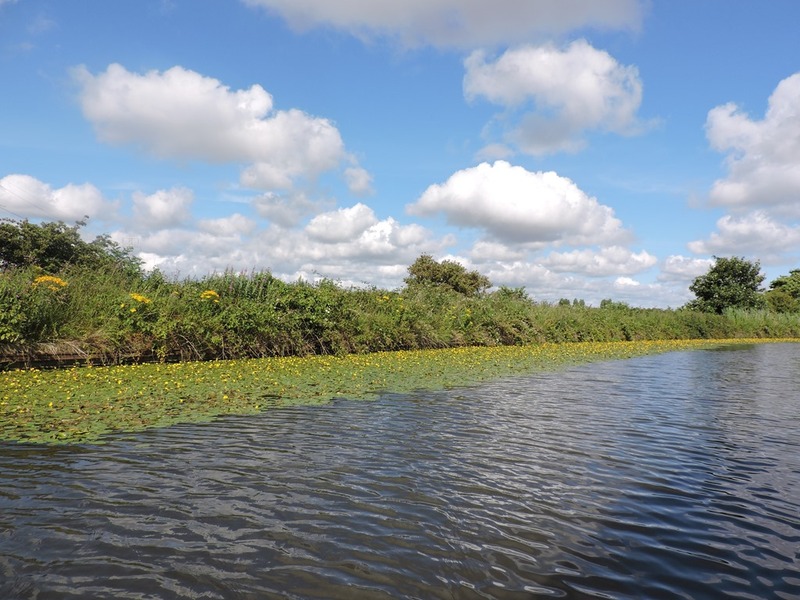 We soon encountered some flashes, which are shallow areas formed by subsidence from salt extraction, extending the width of the canal. 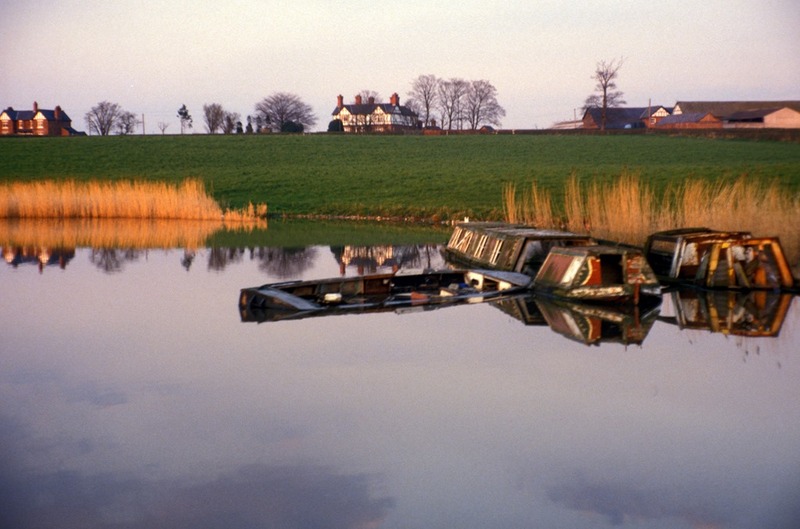 At the end of the canal carrying era numerous unwanted boats were sunk in these flashes as shown in this 1988 photo. (Sinking a wooden boat is actually quite a good way to preserve it as the timber doesn’t dry out.) There is no sign of them now so they’ve either rotted away or, hopefully, been raised and restored. At Northwich we found ourselves passing through the Tata Chemical works reminding us of the reason that canals were built. Tata is one of Europe’s leading producers of sodium carbonate, salt and sodium bicarbonate. 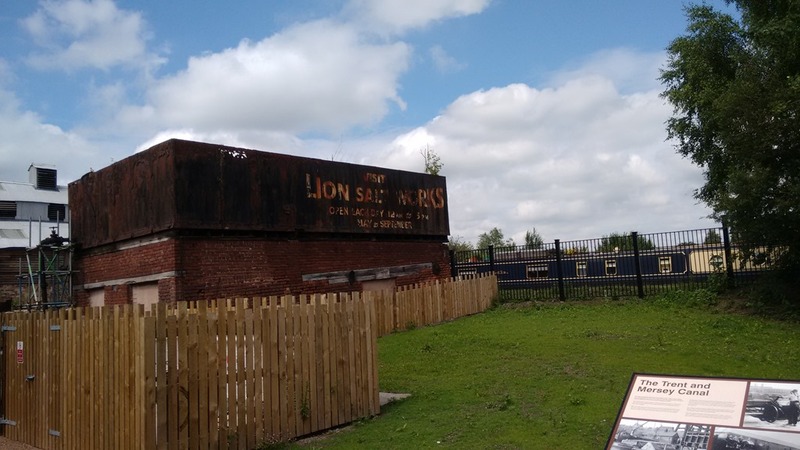 We stopped off at Marston to visit The Lion Salt Works, last time we passed in 1988 it had been closed down for a short while. It’s demise was in 1986 when the West African markets, the major purchaser of natural salt, were lost because of the Nigerian Civil War. 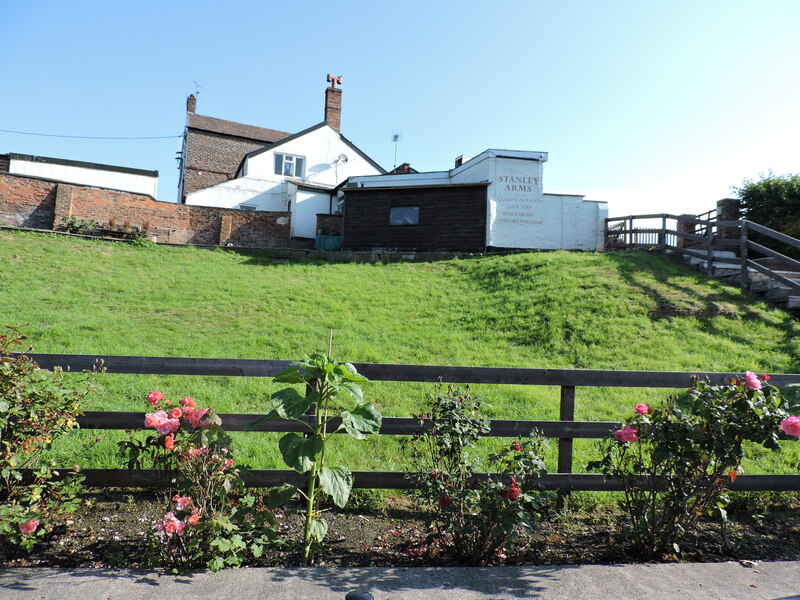 Last month it re-opened as a museum and we were pleased to see that it has been sympathetically restored and many interactive displays are in place using the original equipment. 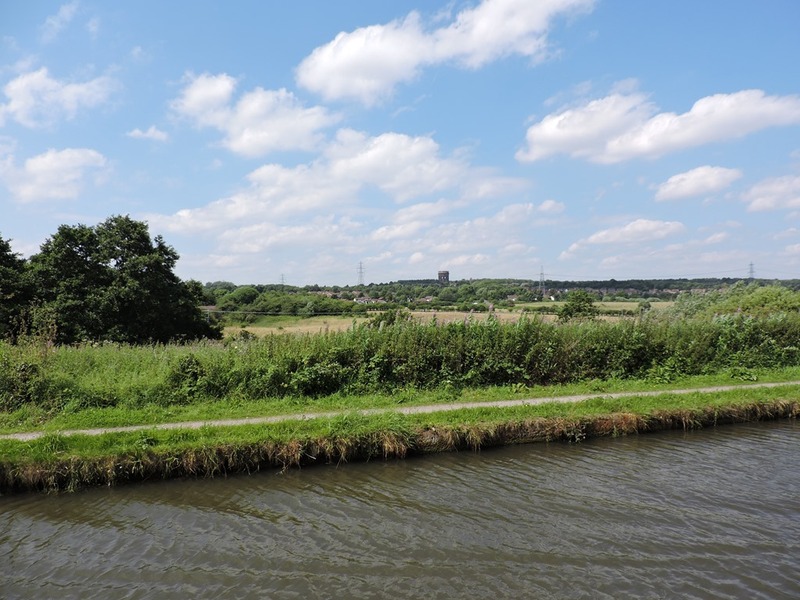 After a break for tea & ice cream we travelled the short distance to Anderton where we bagged a mooring next to the historic Anderton Boat Lift, but more of that tomorrow when we have had a look around.